1. Print the templates onto cardstock. Page one of the template contains everything that will need to be printed on black; page two contains the beak and eye center pieces, which are printed on orange. Cut out all of the template pieces and, as shown in the picture, assemble the eyes and attach the beak to the horns using glue dots. Assemble the box according to the instructions found in the template file. 2. As shown in the picture, attach the feather ruffles to the box using glue dots or double-sided tape. 3. Using a small paintbrush and school glue, cover the beak in glue. Immediately sprinkle the glitter over the beak until it’s completely covered, and allow excess glitter to fall onto a paper plate or piece of paper below. 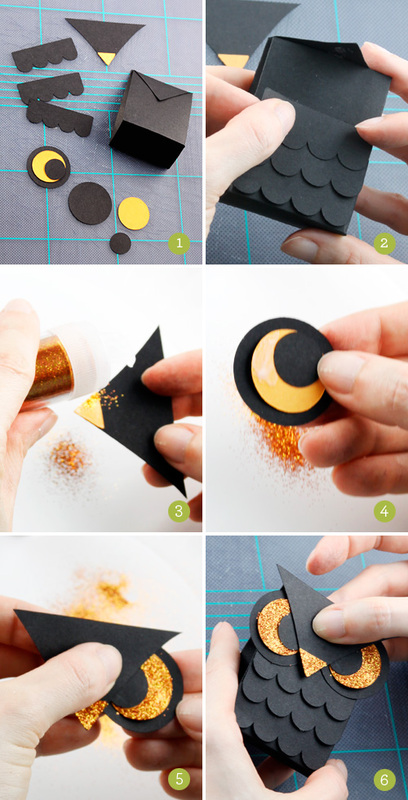 Tap off any remaining excess glitter, and set aside to allow the glue to dry completely. 4. Paint the eye center with glue, and use the technique in step 3 to complete the glittering process. Repeat for the second eye. 5. After the glue on the beak and eyes has dried completely, attach the eyes to the beak/horn piece using glue dots or double-sided-tape. 6. Attach the completed face piece to the front flap of the box using glue dots or double-sided tape. 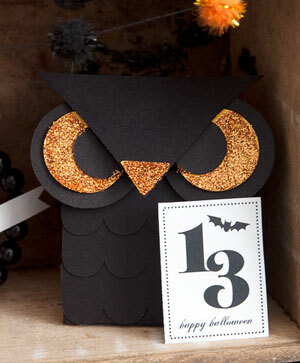 Fill with treats, and seal the box shut using glue dots, double-sided tape, or even a small piece of velcro. ooo! ooo! I love these – so gorgeous! These are adorable. Thanks for the template! Can’t wait to make them. Thanks for this tutorial it’s nice and symphatic. I like very much. Many blessings!!! These are soooo cute I love owls! Can’t wait to make them! I hope you don’t mind, I copied your link and shared it on my website. Amy – I don’t mind at all! Thanks for linking. Oh my goodness!! This is so cute! I saw this on One Pretty Thing and just had to come check it out. I will definitely be bookmarking this to make in the future, Love it! What a great collection of projects, thanks so much. Very clever, you are! Buen trabajo y excelente gusto!! La petite boite est très chouette !!! Thank you for sharing this template and craft! It’s a combination of some of the worlds greatest things: owls, little boxes, an unique ideas (all wrapped up in wonderfulness of being makable by hand). I love this!